My husband's family hosts a large family get together for Easter (think about 35 to 40 people). Luckily, I only have to bring a vegetable tray, but if you're still trying to come up with some last minute decoration or snack ideas, I have a few! 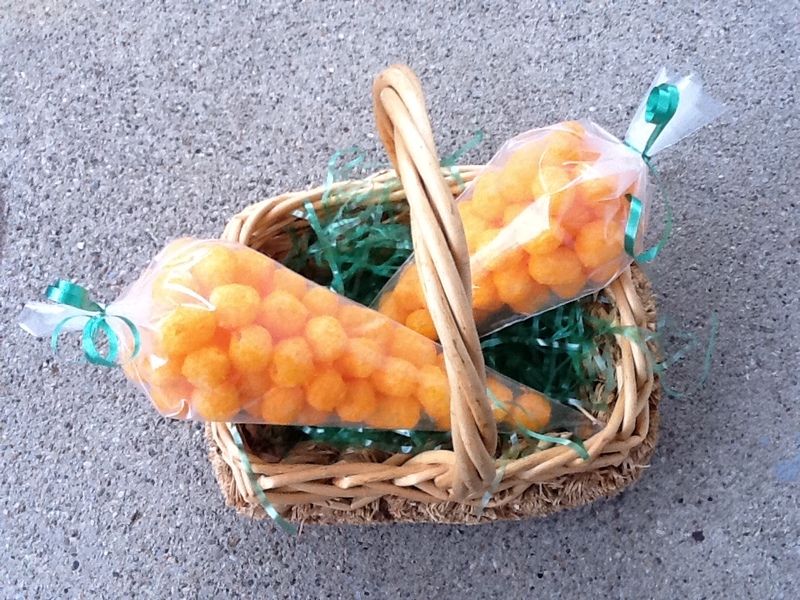 * This Egg Basket doubles as a decoration and a snack! (Plus it's super easy and fast to make.) You need a basket, green floral foam or styrofoam, Easter grass, round and oval shaped suckers. Line a basket with green floral foam and cover with green Easter grass. Scatter around different sized round and egg (oval) shaped suckers. Place the suckers at different heights. Viola! Instant centerpiece. 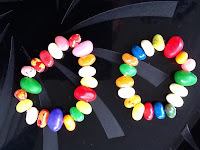 * If you have a gaggle of kids anxiously waiting on food or something to do, try making jelly bean bracelets. My boys have assured me that the bracelets were delicious! You will need a bunch of jelly beans, thread, a needle (and probably an adult to help). Thread the needle, and slide the jelly beans onto the needle, onto the thread. Have the kids hand you which jelly beans they want, so they feel they're making the bracelets too! When they're done, tie them on, and let the kids enjoy their edible jewelry! * Make a carrot bags snack display. Fill clear icing/decorating bags with orange Cheese Puff Balls. Tie the top closed with green ribbon.